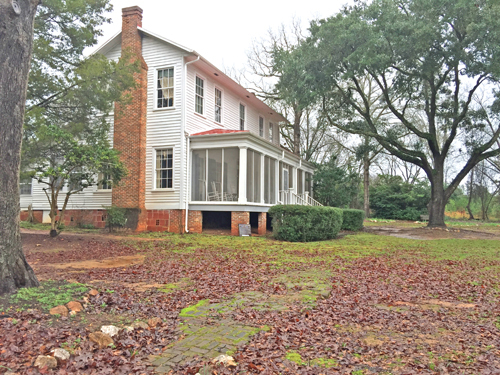 During the holidays – in that quiet period between Christmas and New Years Day, my family did a day trip to Andalusia Farm, the home of Flannery O’Connor, located near historic Milledgeville Georgia. Tim had long asked that we consider a trip to visit Andalusia. He first read Flannery O’Conner in 1974 while a participant in Georgia’s Governors Honors Program then located on the campus of Wesleyan College in Macon Georgia. While at GHP he first red 3 by Flannery O’Conner (now out of print) and was struck by O’Connor’s critical eye for Southern Culture and her perspectives on God’s redeeming grace. It was a rainy holiday season and it rained for what seemed like the whole holiday season. We had a houseful of family and cabin fever. 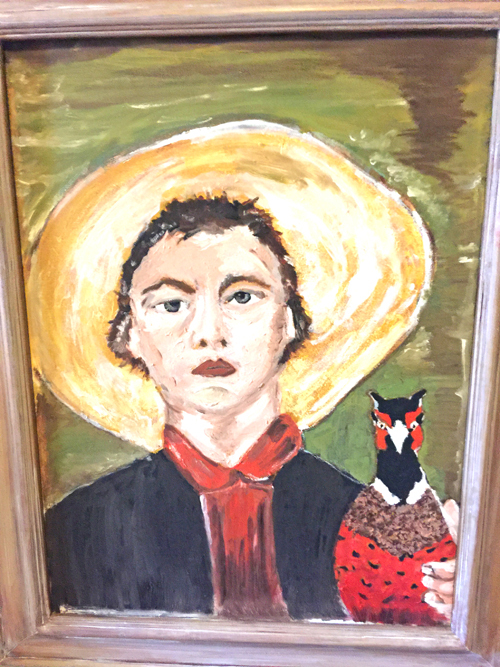 Tim had long mentioned his desire to travel to Flannery O’Connor’s farm near Milledgeville Georgia. While at Governor’s Honors Program then held at Wesleyan College in Macon GA, Tim was first introduced to Flannery O’Connor’s writing. His tattered copy of 3 By Flannery O’Connor continues to be passed around the family. As a rising high school senior Tim was struck then (and now) by O’Connor’s critical eye for Southern Culture and continued theme of God’s redeeming Grace. We wanted to go but did not know what to do with our daughter Caroline’s six month old golden doodle puppy “Georgia”. 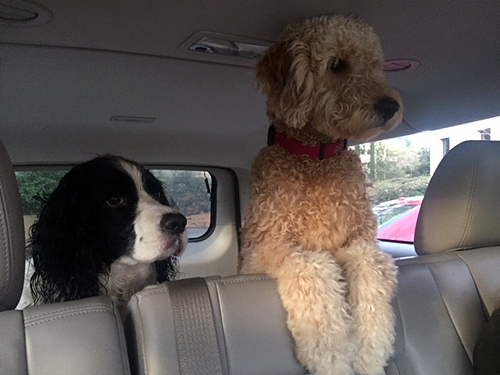 Caroline had driven down from Alexandria, Virginia with Georgia in tow and we did not want to leave her home alone. A quick check of the Andalusia Farm webpage revealed Andalusia is dog friendly. So we loaded up Millie, our English Springer Spaniel, and Georgia for the hour and a half drive to Milledgville. It rained cats and dogs on our drive to Milledgeville. We had a quick drive to the Madison Ga area on I-20 then veered south on Highway 441. After passing Rock Eagle and crossing Lake Sinclair our google map directions clued us in to Andalusia Farm driveway – essentially a small dirt road turn off. There is a small wooded sign but you will miss it given all the shopping centers and fast food joints in the immediate area of the driveway. We turned off on the dirt road and some couple hundred yards later came in view of the white farmhouse and green pastures that comprise Andalusia Farm. Tim said it was a complete match for his mind’s eye of the property from his reading. Pulling around back we parked on the grass and let the dogs out for a stretch. There are a lot of farm outbuildings on the property and they are well marked as to their function during Flannery O’Connors residence. Checking at the front door we learned there is no charge for the visit but donations are appreciated. We brought a check in anticipation of making a contribution to the expenses of keeping the farm open to the public. Ross, who manages visits to Andalusia, sent word to gather our group and he would give us a short tour of the house. 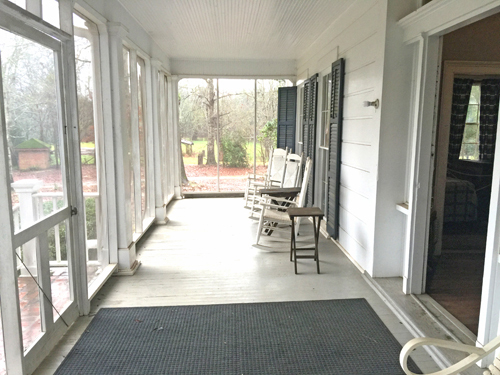 We locked the dogs back up in the Yukon and walked onto the front porch of Andalusia and into the world of Flannery O’Connor. 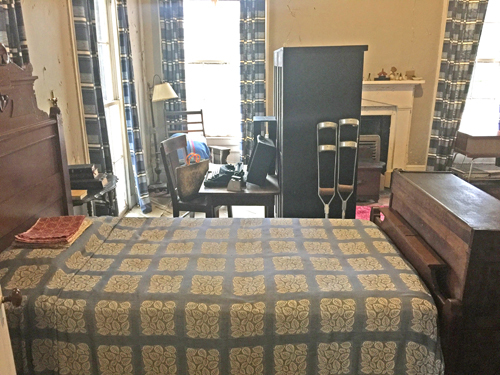 Immediately on our left of the entrance foyer, in a converted parlor, was Flannery O’Connor’s bedroom complete with writing desk, typewriter, walking braces, small bed and bookcases. 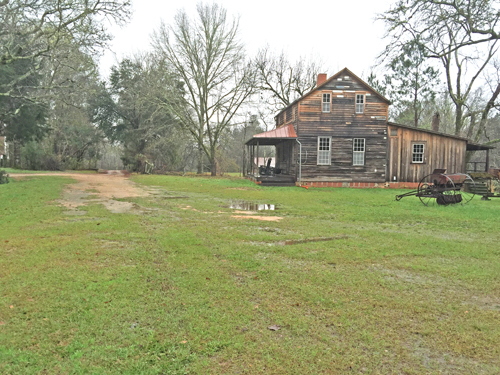 The disease lupus took a toll on O’Connor’s health in later years and she was confined to the main floor of the farm house that she lived in with her mother. We continued the tour into the living room and then to the kitchen. 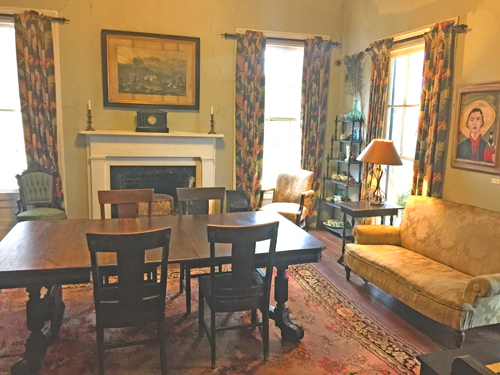 The furnishings are comfortable but humble and are surely props for faded elegance in O’Connor’s books. A silver plated martini shaker copy of her self-portrait add delightful details as we pried into her personal life. There is a short film for visitors and a small bookshop selling Flannery O’Conner books and mementos. She would probably be horrified but we loved it. 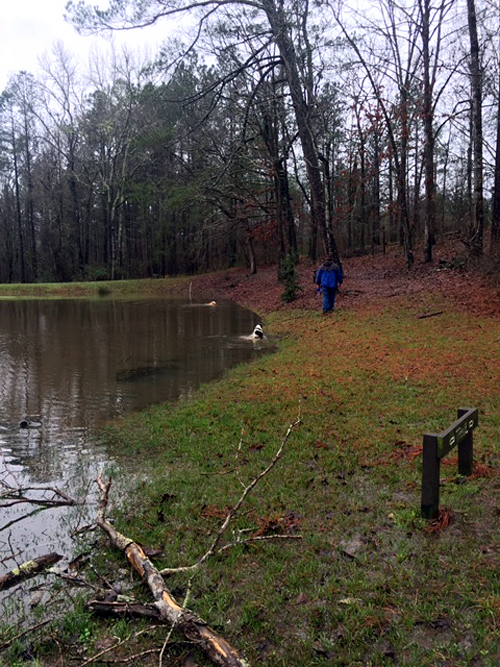 After touring the home we let the dogs out of the truck and began a delightful walk around the property. There are peacocks kept in a pen, dairy barns, a house the farm manager lived in, equipment sheds and pastures. 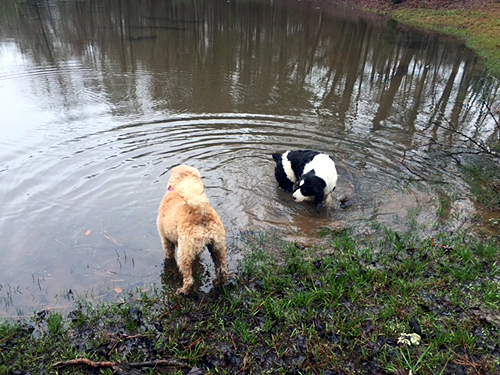 We let the dogs out for a run in the lake area and they enjoyed swimming in the lake and racing around the green pasture. Following our visit we traveled down 441 a few minutes south to Milledgville where we had a southern “meat and three” lunch at Stella’s diner off Martin Luther King Drive. The food was delicious and watching Stella and her family at work was a treat. We then drive around Milledgeville for glimpse at the original Georgia State Capital, Governors Mansion and the Catholic Church the very devout Flannery O’Connor attended. We vowed to come back for a more in depth tour.